The maker of a will, commonly known as the "testator," must draft the will in accordance with the state's probate code for it to be held as valid. Generally, these formalities exist so that a probate court can verify the authenticity of the will. When a will is admitted to probate court, the court examines the will to make sure it was made in compliance with state law. Among a probate court's many duties is to prove the validity of a will. After all, the term "probate" in Latin means "to prove." If a will contains abnormalities, or if it appears inauthentic, a probate court may declare it invalid. Generally, problems with a will, such as a testator's mental incapacity, duress or fraud, are brought to the attention of the probate court by the will's beneficiaries and/or the testator's heirs. Although there are minor deviations in state law regarding will formalities, typically a will must be signed by the testator and two witnesses. Usually, witnesses are required to sign the will in the presence of each other and the testator. Their signatures symbolize acknowledgment of the testator being of "sound mind." That is, capable of understanding the impact of making a will. If a will lacks witness signatures, a probate court may declare it invalid as it's difficult to verify authenticity without proof the witnesses were present during the will's execution. Self-proving affidavits are common in many states. These documents are usually signed during the execution of a will and attached to it. They are notarized and include an oath by each witness acknowledging their presence at the time of execution. Generally, if a will is not self-proved, one of the witnesses will be called to sign an oath in front of a probate court official indicating the will is authentic. If a testator's heirs believe there are problems with a will -- usually as a result of being omitted from it -- they may challenge its validity in probate court. For example, if a testator unexpectedly disinherited his children in favor of an acquaintance, his children may contest the will in probate court and the court will hear testimony. Sometimes experts are called to testify before the probate court, providing opinion on matters that fall within their expertise. For instance, if heirs believe the testator's signature was forged, a probate court may call upon a handwriting expert to examine the signature and provide expert opinion as to its authenticity. Oregon State Bar: What Is Probate? 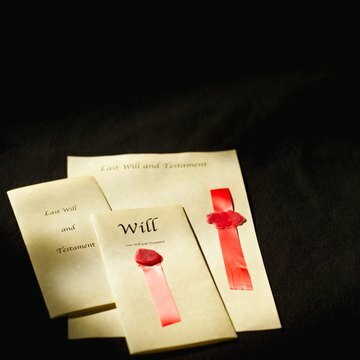 Last Will and Testament: Last Will and Testament Formalities - Is It Valid? Writing a valid will ensures that your property is divided according to your wishes. If you fail to make a will, or if you do not sign it properly, the state authorities will make those decisions on your behalf. To be legally valid, a will should be signed and witnessed in accordance with state laws. A self-proving will contains a certification that the will has been properly executed and makes the probate procedure more straightforward. Article 3 of the New York Code sets out the laws relating to signing wills in the state. Laws regarding last wills vary slightly among all states, but in general, a will must meet certain requirements to be valid. A will is not guaranteed to be valid in all states because each state and its probate courts may apply the law differently and have different requirements. A will should be property executed so the testator's intent can be implemented upon his death. What Is the Act or Process of Proving the Validity of a Will? Before a court can probate a will, it must determine that the will is valid and authentic. Although laws vary from state to state, proving the validity of a will generally entails ensuring that it was created and signed by the person executing the will, called the "testator," and that it complies with state law. In most states, a will can be prepared in a way that eliminates any additional action on the part of the executor during the probate process.